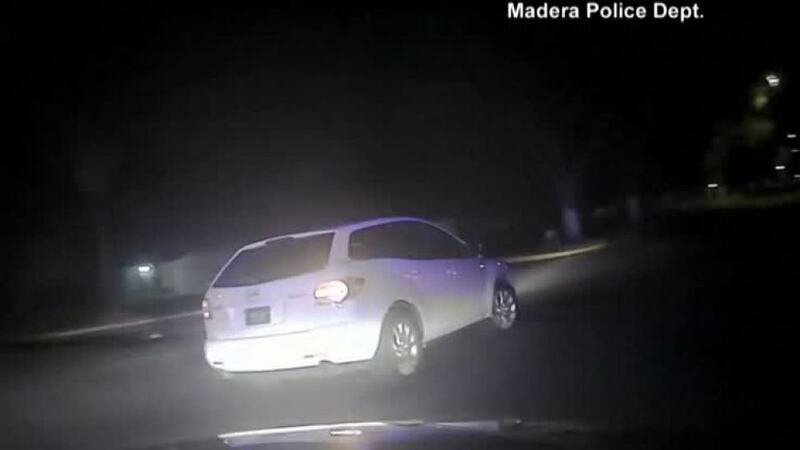 Bullets narrowly missed a civilian taking a ride in a police cruiser in central California early Sunday morning, when a traffic stop turned into a police chase. Many citizens who want to understand the job of police officers and get a sense of the excitement of the job go on ride-alongs, like the woman in Madera. But her morning was anything but routine after a suspect ended up firing 14 rounds at the patrol car, leaving the passenger scratched by broken glass and crying in fear, but safe, Police Chief Steven Frazier recapped Monday at a news conference. Originally, police had said nine rounds were fired. The story, and especially the dashcam video police posted of the shootout and chase, has been seen nearly 1 million times on the department's Facebook page, and made its rounds on the TV morning talk shows, including the "Today" show. "By the grace of God," Frazier told reporters, "this officer and this civilian ride-along are with us today." Officer Julian Garcia, who was on his second week of the job and spotted a Mazda with a broken headlight, wasn’t injured and the woman on the ride-along suffered minor scratches, Frazier said. She is part of the department's volunteer citizen's academy. She declined to be interviewed or identified. Madera is in San Joaquin County near Yosemite National Park. The ride-along started off normally on Sunday about 4:30 a.m., police said. Garcia tried to stop a Mazda SUV traveling west on Howard Road because the car had a broken headlight and the driver failed to stop at a stop sign, according to the dashcam video and the chief. "He's not stopping," the woman is heard asking in the video, before a chase ensued. When the Mazda turns onto Lighthouse Drive, its front passenger is apparently seen sticking a gun out the window, prompting the officer's passenger to say, "He has a gun! No, no, no, no!" Approximately 14 rounds were fired at the police car, Frazier said. The patrol car was struck by three bullets, two of them through the windshield, and the patrol car was disabled. Frazier said that one of the bullets even landed inside someone's home in a pile of laundry. The Mazda sped away, and the police cruiser pulled over. "You OK?" the officer is heard asking the woman, who begins sobbing in the car. The Mazda was later found abandoned on Krest Street, and police found an AR 15-style pistol and other evidence, which they didn’t detail. Det. Sgt. Johnny Smith told NBC Bay Area there were paper license plates on the car, which was stolen from Fresno. Police have not announced any arrests, and the chief said they were looking for at least two suspects. Frazier said that he believes this video should be a prerequisite for all ride-along candidates so they can see what officers face day to day. He doesn't think the department will change its ride-along policy in any way, but he expects some citizens might refuse to participate after what happened this weekend. "I think what occurred," he said, "is that at any time, any situation can go sideways. And this young lady experienced that."